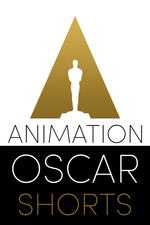 Shorts International presents a theatrical release of the five Oscar nominees for Best Short Film, Animated, plus four "Highly Commended" animated shorts. Me and My Moulton: A pleasant enough film about three daughters of some slightly eccentric parents in 1960s Sweden, but I didn't find it particularly outstanding. Feast: A Disney short which screened in front of Big Hero 6. A warm-hearted, funny film. Apparently it's considered the front-runner for the Oscar; I'd rank it second behind The Dam Keeper but wouldn't object if it won. The Bigger Picture: Technically amazing, with its combination of life-size(!) 2D animation and stop motion (see the "Making of" video), but I found the story rather dry. A Single Life: Very short film with basically a single gimmick, but well done for what it was. The Dam Keeper: Longest of the nominated shorts in this category at 18 minutes, and also the only nominee I had seen before seeing this program. A young anthropomorphic pig maintains a dam which protects a town from an encroaching darkness. Well animated and a good, if simple, story. This would be my choice for the Oscar, if it were up to me. Footprints: Bill Plympton, with good animation as always, and a better story than in some of his other short films I've seen. A man awakes to find a window broken, and footprints leading away from it. He follows the footprints to try to track down the culprit. Duet: Seems pretty well covered in the previous thread on the Blue; nothing to add to the discussion there. Bus Story: Decently funny film about a woman who wants to be a... school bus driver? Sounds like a weird premise, but I thought it worked. A general observation: at least three of these nine films had darkly humorous moments where you might not expect them. I thought the selections this year were generally an improvement over the last few years', which tended to have a heavy helping of mawkish sentimentality and/or clichéd stories and premises. Duet was the only real offender this year, and arguably the skill of the animation made it a tolerable watch. Just saw these tonight! I agree with soundguy99 that they seemed less mawkish than previous years (though I don't have a great basis for comparison, this is only the third year where I've seen them all). I loved M&MM, I thought it was sweet, charming, and real. A Single Life was incredibly winning, a really well executed concept. The Dam Keeper was done in a lovely style but the narration and story didn't grab me. The Bigger Picture's unique style suited the story well, but like DA I found it rather dry. Feast was cute but not the most original thing in the world (and pretty similar to 2012's Adam and Dog, which itself was not strikingly original). I didn't really dislike any of them. No matter who wins, it will be deserved, but MAN do I wish Bus Story was up there, too. An excellent, idiosyncratic story with a fitting animation style. I laughed so hard I actually cried.